I'll be the first to admit that I often revisit the same places in Second Life over and over, even though I do try to make a point of seeing something new once in a while. And I'm over-reliant on event notices from groups to which I belong. 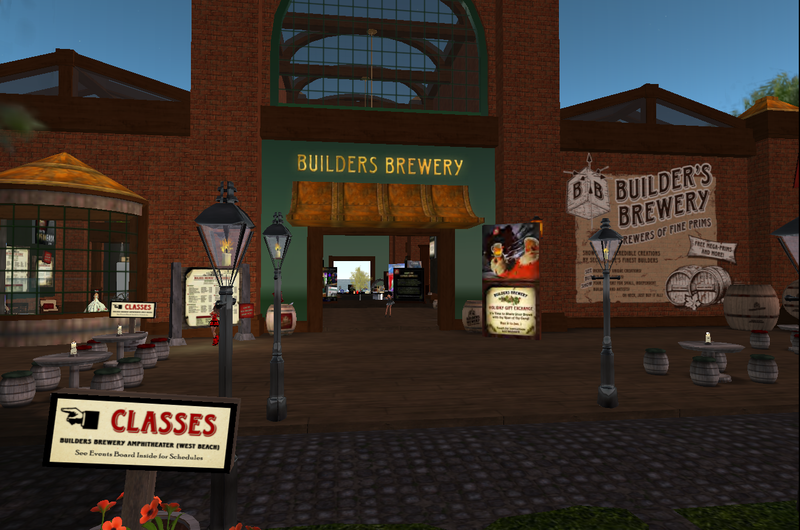 So I decided today to fearlessly strike out to see what else is happening around the grid, and the very first spot I happened to pick—Builder's Brewery—gave me a real "palms-to-face" experience, as I wondered how I could have ever not known of its existence. I've recently discovered the joys of building (thanks in large part to Sextan Shepherd and Nemo, although I'm far from having anything like Sextan's technical proficiency! ), and Builder's Brewery is just the place for me: "Our goals are to help improve the visual and structural quality of SL, by encouraging intelligent builds, textures and innovations, thru education, sharing and support." I see other classes from earlier in the week that I'm sure will be repeated—Easy Spiral Stairs, Scripting for Beginners, Seamless Textures and more. So stop by and enrich your mind and skills! Not into building? If you're the literary type, venture over to Circe's Sanctuary at Laurel Arts Isle, owned by Circe Broom-Merricks, for some live poetry on Saturday at 11. DonJuan Writer, whose first name is a reference to Carlos Castaneda's mentor Don Juan Matus, will read some of his works—he's been writing poetry for a number of years and has been a featured poet/performer throughout SL. 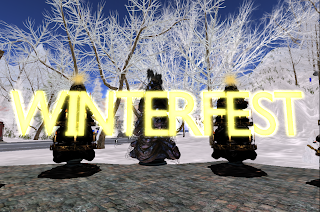 Of course, the biggest bunch of events this weekend—starting tomorrow and running and throughout next week—is Winterfest, a cornucopia of music, winter sports and silliness. Be sure to bring your mittens! I'm most looking forward to the Linden-Resident snowball fights on December 16th at 4 pm and December 17th at 8 am (Chamonix City's Kerry Gretzky tells me that Torley Linden promises to be at snowball fight #1), but between now and then don't miss the Hockey All-Star Game, which starts at 3 pm on Sunday, December 12th (also viewable on Treet TV if you prefer), and lots of other stuff from a Snowman Building Contest to Snow Maze Races! See the Winterfest blog post by Delby Linden for more info. Heh Heh...Glad you found the Brewery! Yes it's so cool... and it seems that most of us find it 'cause a friend tells us. Lucky You!! !